Guns don’t kill people, opaque backpacks do, apparently. Students from Marjory Stoneman Douglas High School returned from Spring Break yesterday only to be greeted with a few new school safety measures. Following the shooting on February 14 that left 17 dead and sparked a nationwide student-led campaign against gun violence, Florida’s Broward County school board have outlined a new list of safety protocols. Some measures are districtwide, including ID badges and shooter training, while others apply specifically to Marjory Stoneman Douglas High. As well as armed officers and barricades, one of the exclusive rules is that every student must carry a clear backpack (provided to them, so kindly, “at no cost”). And unsurprisingly, the students all immediately took to Twitter to ridicule the hell out of them. 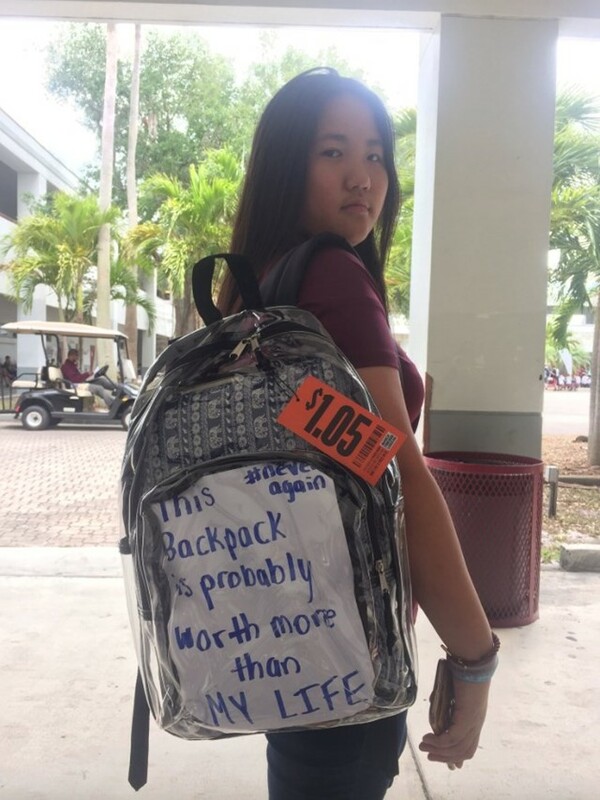 Others shared photos of how they’ve chosen to decorate their new bags, with many continuing the poignant statements from the March For Our Lives, attaching $1.05 price tags to their backpacks – reflecting how much each Florida student is worth to Republican senator Marco Rubio. Although the new list of protocols aims to protect students and make them feel safe at school, it’s easy to understand the teens’ frustration with new measures that vilify them and make their school “seem like jail”, when legislators are doing nothing to address the gun laws that enabled a 19-year-old boy to get hold of a semi-automatic rifle in the first place. Watch US teen gun control activists perform their poetic call to action here.